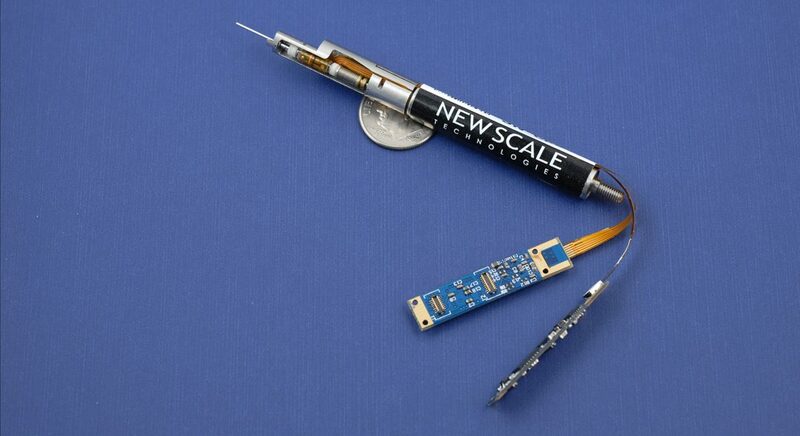 New Scale worked with NASA JPL/Caltech to design and manufacture the Cobra Fiber Positioner, a slender, two-stage rotary positioning system comprising two rotary piezoelectric SQUIGGLE micro motors. The Prime Focus Spectrograph (PFS) is a fiber fed multi-object spectrometer for the Subaru Telescope that will conduct a variety of targeted surveys for studies of dark energy, galaxy evolution, and galactic archaeology. The key to the instrument is a high density array of fiber positioners placed at the prime focus of the Subaru Telescope. The system, nicknamed the “Cobra” fiber positioner, will be capable of rapidly reconfiguring the array of 2,394 optical fibers to the image positions of astronomical targets in the focal plane with high accuracy. The system uses 2,394 individual “SCARA robot” mechanisms that are 7.7mm in diameter and use two custom rotary piezoelectric motors, developed by New Scale Technologies, to individually position each of the optical fibers within its patrol region. Updated design and test results were presented at the SPIE Conference on Astronomical Telescopes and Instrumentation in 2014 and 2012. Initial development of the system was described at the 2009 IEEE Aerospace Conference. In May 2016 New Scale demonstrated full production capacity — 200 per month — of Cobra fiber positioners for the Subaru Telescope PFS program. Production results are exceeding projections for yield and efficiency. New Scale plans to deliver a total of 2,550 Cobra positioners to the California Institute of Technology by June 2017. Cobra production demonstrates New Scale’s unique competencies in technology development combined with large-scale micro mechatronic manufacturing. We expect to contribute these skills to other fiber spectrometer programs in the near future. Cobra is a two-degree-of-freedom mechanism that can position an optical fiber in the prime focus of the telescope to a precision of 5 µm. It is a theta-phi style positioner containing two rotary piezo SQUIGGLE motors with one offset from the other, which enables the optic fiber to be placed anywhere in a 9.5 mm diameter patrol region. This patrol region is larger than the 7.7 mm diameter of the actuator, enabling a close packed hex array pattern of positioners to have overlapping patrol areas and deliver 100% sky coverage. The SCARA robot was given the name Cobra because it resembles a snake ready to strike. Be able to make very small steps and quickly converge on a target position using open-loop positioning. Provide adequate torque to overcome the twisting of the optical fiber and friction within the positioner. Have a small diameter to enable a close-packed array pattern. The overall height of the Cobra positioner is not constrained, but efforts were made to keep Cobra as short as possible to reduce the effects of gravity sag. Custom rotary piezoelectric motors using New Scale Technologies’ patented SQUIGGLE micro motor technology were demonstrated as the best solution to meet the requirements of size, torque, resolution, and cost. A variety of other positioner concepts were explored but not prototyped, as the rotary SQUIGGLE motors performed exceptionally well. Working with JPL’s design requirements, New Scale optimized the miniature rotary motor for high torque and precision. The custom rotary motor created for the Cobra features torque >3.0 mN m and step size <0.065°. Each Cobra fiber positioner will include one 4.4 x 4.4 mm and one 2.5 x 2.5 mm motor in a two-stage theta-phi configuration. The Prime Focus Spectrograph will have 2,394 Cobra positioners in a close-packed hex array pattern on 8-mm centers. Fiber Tilt Error ……………………… < 0.3 deg. The Cobra positioner was tested in a lab environment in a manner that simulates its use on the Subaru telescope. The positioner was controlled in open loop and used a CCD camera to image its optical fiber to determine its location. Over 100 simulated cosmological targets were tested using the Cobra positioner and showed that the Cobra positioner can converge on over 95% of its targets within 5µm in six open loop move iterations. Visit the Subaru Prime Focus Spectrograph website to learn more about PFS and its mission to explore the nature of dark matter and dark energy, and the history of galaxies (opens in new window). Development of the engineering modules was presented at the SPIE Astronomical Telescopes + Instrumentation Conference in June 2014. The requirements, design, assembly techniques, development testing, design qualification and performance evaluation of EM Cobra fiber positioners are described here. Also discussed is the use of the EM build and test campaign to validate the plans for full-scale production of 2550 Cobra fiber positioners (at New Scale Technologies). Get the paper from SPIE or email New Scale for more information. Original design and test results were presented at the 2009 IEEE Aerospace Conference, paper #1185. Download the IEEE paper (4Mb PDF). Further developments were was presented at the SPIE Conference on Astronomical Telescopes and Instrumentation in 2012 (paper #8450-41) and 2014 (paper #9151-68).The IEEE paper is posted here with permission of the IEEE. Such permission of the IEEE does not in any way imply IEEE endorsement of any of New Scale Technologies, Inc.’s products or services. Internal or personal use of this material is permitted. However, permission to reprint/republish this material for advertising or promotional purposes or for creating new collective works for resale or redistribution must be obtained form the IEEE by writing to pubs-permissions@ieee.org. By choosing to view this document, you agree to all provisions of the copyright laws protecting it. Contact New Scale. Our engineering team works with OEM customers to integrate small, precise and smart motion systems into your next-generation designs. Contact us today.